So here we are again with another Six on Saturday, a lovely blog meme from The Propagator. It is a bit grey here, but really warm, quite muggy in fact, but at least I got the decking and steps swept before it started to rain. And so to the first of this week’s six things from our garden, a Vietnamese mint plant I picked up last week. I love the smell, and the leaves are so pretty: a welcome addition to my small, but growing, herb collection. Another new addition is this chicken thyme. It really smells like roast chicken too and I’m eager to pair it with just that in the near future. Third up is a catnip plant. I have to say neither Charlie nor any of the neighbourhood cats have yet to pay it any attention. I had visions of drugged cats all over our terrace, but the plant remains untouched at the moment. We will wait and see…. 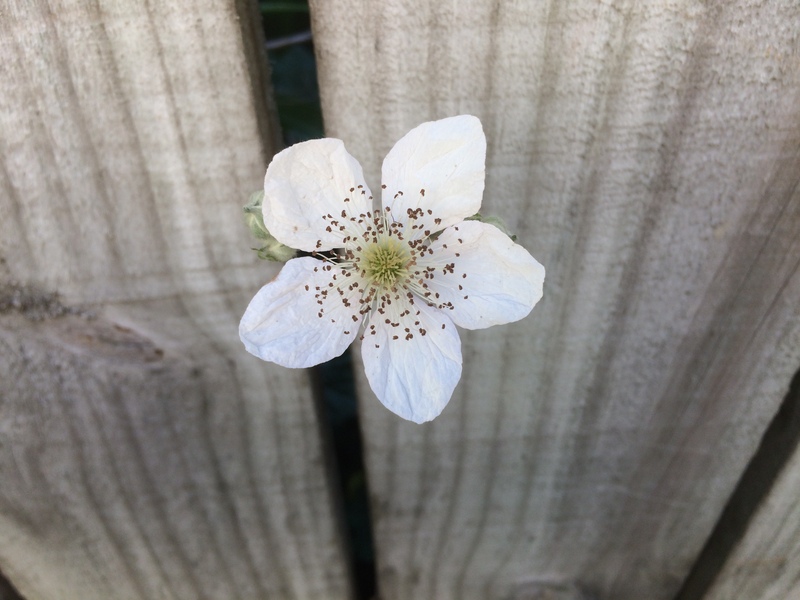 Not strictly in the garden, but there is always some flower or other pushing its way through the fence on the steps up to our house, such as this little periwinkle, and the bramble flower at the top of the post. I always keep my eyes open for these little surprises. There are roses all over the place right now, with some stunning blooms in the Lady Norwood Rose Garden. Do check out my recent post if you are a rose lover. The ones below were peeping over the fence. Unfortunately, there are no roses in our yard, so I just enjoy other people’s instead. You can find Thistles and Kiwis on Facebook, and also on Instagram@thistleandkiwis. As for Twitter….am totally inactive these days. If you want to get in touch, email me on thistlesandkiwis@gmail. I’ve pretty much done the opposite of planting anti-cat plants lavender and curry plants. Didn’t have any effect. Still in and eating tomatoes, which I don’t think does them any good. Part of why I’ve tried to put them off. There are lots of cats around our way, including our own. Funny about tomatoes…our cat tried to eat one once,. I wondered if it was the water in them? Next doors eats the bird seed too. Can’t see it’ll do it much good as a carnivore. Don’t think they can digest it. I don’t have catnip plants but Nepeta and kiwi vines make mine crasy ! He loves them ! I was surprised our cat just ignored the catnip…maybe it is in the wrong place. I hear it is also good for keeping away insects, so we’ll see once summer is here. I looked at your picture of Vietnamese mint and thought it looked like a Persicaria so I googled it and it is, Persicaria odorata, aka all sorts of things. Bit of a surprise that a Persicaria is edible, didn’t know that. There are lots of ornamental ones grown for leaves and flowers. Oh…it was labelled Vietnamese mint at the garden centre and I found it in the herb section. I better double check. In any case, it looks pretty. And I never knew there is such a thing as a chicken thyme! need to sniff it if I can get the chance. I can totally see my daft dogs digging it up looking for the chicken. No it was new to me too. Would love to see if your dogs reacted like that!! It’s great when your neighbours’ plants can add enjoyment to your own garden. Having said that, I was annoyed last year when our only sunflower to survive the snails and slugs decided to flower facing the neighbour’s garden. Oh that must have been annoying! The dreaded periwinkle! Don’t let it in, it’s a right pest in my garden. I do battle every spring. Luckily it isn’t too close to our patch! I’ve never tried Vietnamese mint – can you use it in cooking? I’m another one interested in the Vietnamese mint. Like Jim, I thought it looked very persicaria, so loved the leaves, but the Web tells me that its flavour is a cross between mint & coriander. I’m one of those folk for whom coriander tastes like soap, so I’d be really interested in trying this, to see if it’s sans soapy flavour. There are so many wonderful thymes out there, but this is the first I’ve heard of roast chicken! That should also be good. I covet your neighbour’s roses, btw. The Vietnamese mint has a sort of spicy smell if that makes sense. I love both mint and coriander so a cross would be good I think it must be a Vietnamese mint as it was labelled that in the garden centre and I can’t imagine they would make a mistake? The thyme though…now that really does smell like roast chicken! I also covet my neighbours roses. I think Jim meant they’re in the same family, not that it was mislabelled. Think I may have to get one!